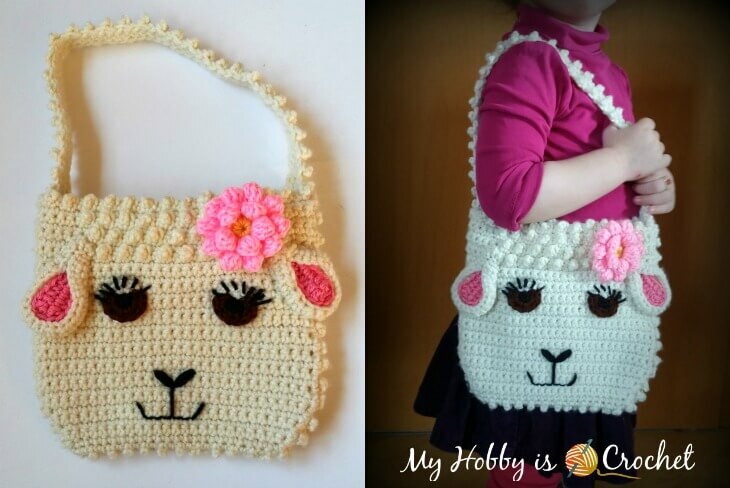 After seeing the Lamb Baby Bib I have designed a while back, my little girl told she would like a sheep crochet purse! 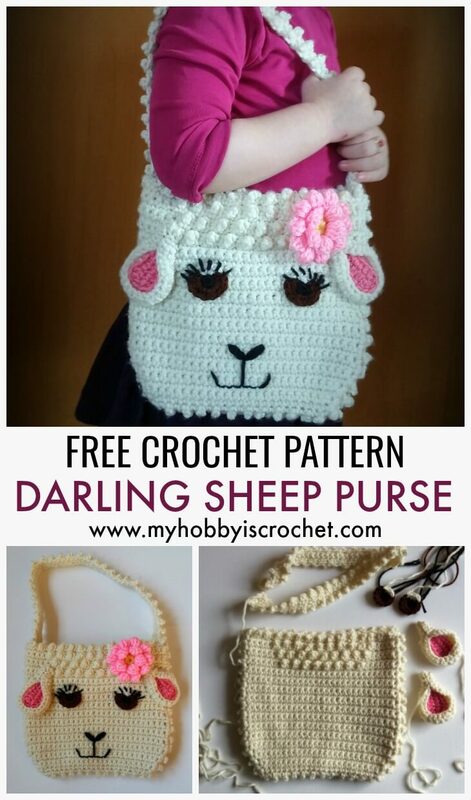 I'm happy to introduce you the Darling Sheep Purse! I hope you will love it as much as she does! 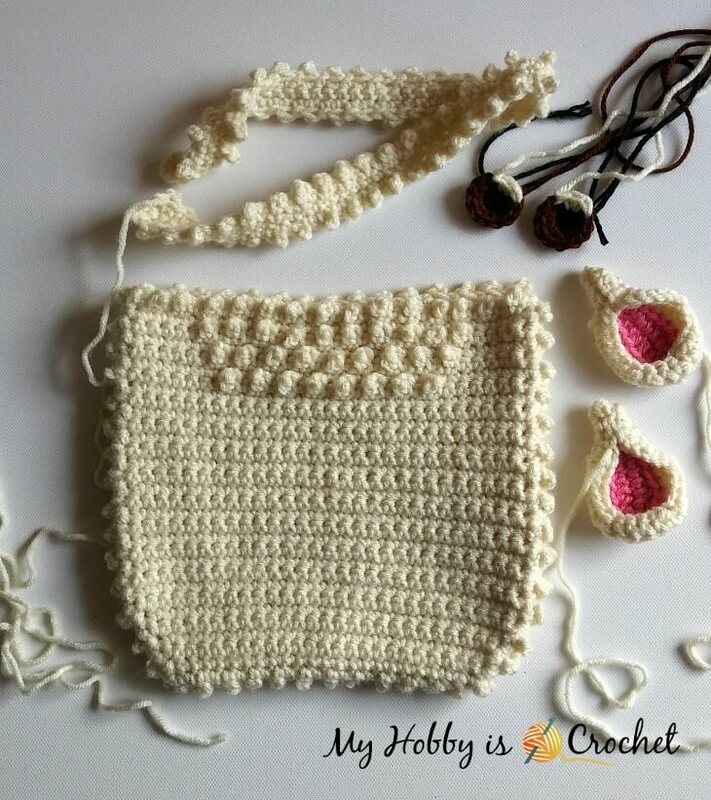 This sweet crochet purse could make a great Easter gift. And why not? An all year round gift! 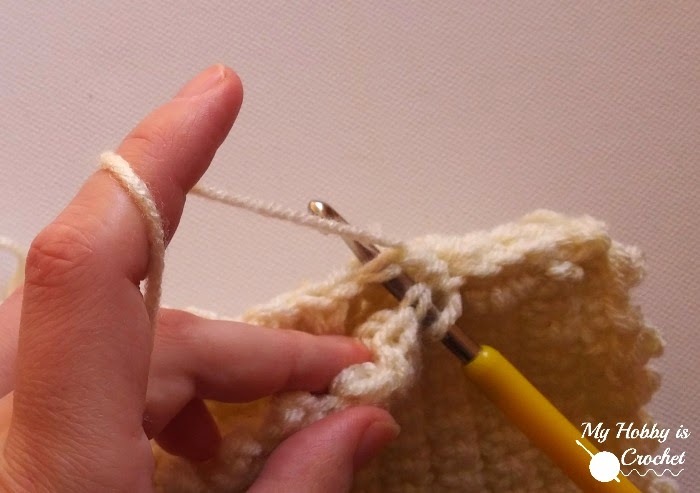 1. psc: picot single crochet/ granule stitch : See this Video Tutorial by Moogly. With a 6 mm crochet hook and MC, chain 24. Row 24 (On the wrong side): 1sc in first st and 1 sc in each of next 6 sts, (1psc in next st, 1sc in next st) x8 times, 1 sc in each st till end of row, ch1, turn. Row 26 (On the wrong side): 1sc in first st and 1 sc in each of next 5 sts, (1psc in next st, 1sc in next st) x9 times, 1 sc in each st till end of row, ch1, turn. Row 28 (On the wrong side): 1sc in first st and 1 sc in each of next 4 sts, (1psc in next st, 1sc in next st) x10 times, 1 sc in each of next 3 sts, ch1, turn. Row 30: (On the wrong side): 1sc in first st, *1psc in next st, 1sc in next st, repeat from * across, ch 1. Do not turn! Continue to work granule stitch on the wrong side around the face: 1sc in first st, *1psc in next st, 1sc in next st, repeat from * around, with 2 sts into corner sts, continue the same way till you reach to top. Cut yarn. Fasten off. Repeat as for the front side till row 23, inclusive row 23. Rows 24-29: Continue working as row 23, sc in each st across. Row 30: (On the wrong side): 1sc in first st, *1psc in next st, 1sc in next st, repeat from * across, ch1. Do not turn! Continue to work granule stitch around, the same way as for the front side. Ch 1 and cut the yarn leaving a long tail to join front and back pieces together. Turn both front and back pieces on the wrong side and place them one on top of each other. With the long tail of the back piece, join the pieces together, slip stitching through both top loops of each side, pushing the psc sts through to pop out on the right side of the purse, as in the picture. With 6 mm crochet hook and soft pink yarn work 9 chs. R1: 1 sc in 2nd ch from hook and 1 sc in next ch, 1 hdc in each of next 2 chs, 1dc in each of next 3 chs, 3 dc in last st. Do not turn! Continue working in the round on the opposite site of foundation chain: 1 dc in each of next 3 chs, 1 hdc in each of next 2 sts, 1 sc in next ch, 2 sc in same ch used for the first sc at beg of round, sl st to top of first sc. Cut yarn. Fasten off. R2: Join MC with a standing sc into back loop of first sc of previous round. Continue working only into back loop of stitches: 1 sc into same st as the standing sc, 1 sc in next st, 1 hdc in each of next 3 sts, 1 dc in each of next 2 sts, 2 dc in each of next 3 sts, 1 dc in each of next 2 sts, 1 hdc in each of next 3 sts, 1 sc in next st, 2 sc in each of next 2 sts, join with sl st to top of first sc. R3: ch1, 2 sc in first st and 2 sc in each of next 2 sts, 1 hdc in each of next 6 sts, 1 sc in each of next 4 sts, 1 hdc in each of next 6 sts, 2 sc in each of next 5 sts, join with sl st to top of first sc. Cut yarn leaving a long tail. Fasten off. With a 4.5 mm hook and black yarn make a magic ring. Round 1: work 6 sc into ring, sl st to top of first sc. Cut yarn. Fasten off leaving a tail to embroider later the eyelashes with. Round 2: Join brown yarn with a sl st to top of a sc of previous round, ch1, work 2 hdc into same st as the sl st and 2 hdc in each of next 4 sc, at the half of the last hdc change to white, finish the stitch and continue with white 2 hdc in last st, sl st to top of first hdc. Cut yarns, leaving a long tail to sew the eyes onto purse. R2: 1 sc in first st, * 1 psc in next st, 1 sc in next st, repeat from * till last st, work 3 sc in last st.
Do not turn anymore! Continue working on the opposite site of the foundation ch: * 1 sc, 1 psc*, repeat from * to * so that the psc stitches of the sides are perfectly aligned like in a mirror, ending with 1 sc in last st. Cut yarn leaving a long tail to sew the other side of the handle onto purse. Sew the year and the eyes, embroider the nose, the mouth and the eyelashes referring to the main picture. Pinning the pieces in place will be a great help. Sew the handle to the inside of the purse, putting your strap down about 5 cm to the inside (on both sides). Sew in all ends. 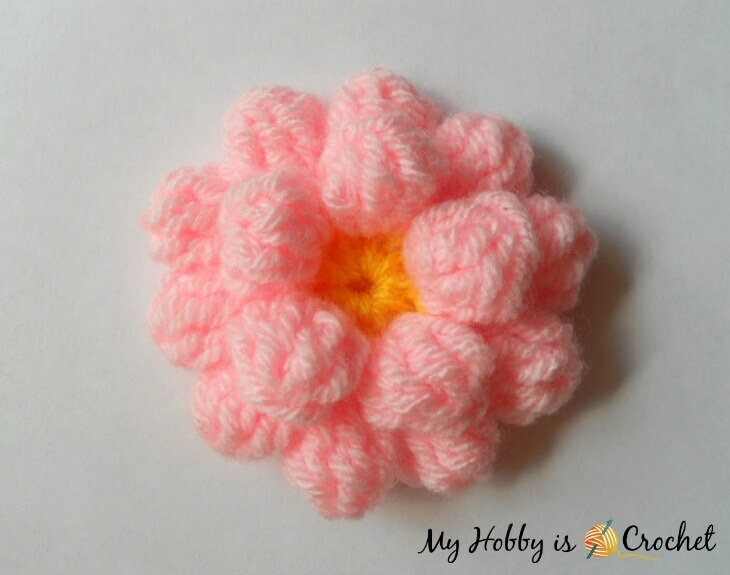 You can find the free Dahlia Flower pattern here. I haven't used any button to close the purse, but if you like, you could leave the flower out and sew a button in the middle of the top front side and work a button loop in the middle of the edge from the back side: join yarn and work as many chain sts to fit your button, sl st into same st as the joining. Cut yarn and fasten off. 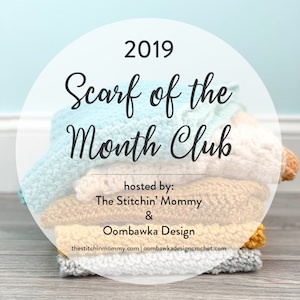 I hope that you have enjoyed this pattern!